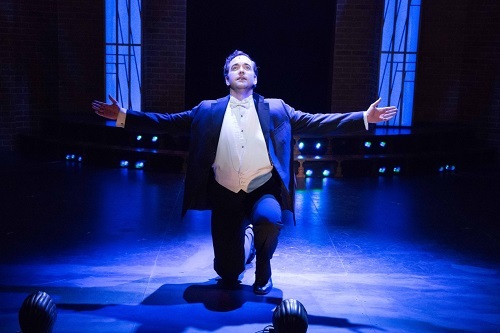 Harold Green Jewish Theatre Company and Dancap’s reimagined production of The Jazz Singer is an extremely savvy example of social justice storytelling at the theatre, which deftly preserves the timeless and meaningful points of the original story, while shedding that which no longer serves it. The original 1920s musical is loosely based on the real life of legendary 20s crooner Al Jolson, who made his name on stage performing in minstrel shows in blackface. Relax. There was no blackface in this production. Director Timothy French and script-reimaginer Michael Ross Albert figured out that audiences would likely have this reaction. As in the original story, young New York Jew Jackie Rabinowitz breathes and sleeps jazz, but his father wants him to follow in the family footsteps and become a cantor. Jackie leaves his unhappy home life to pursue his dreams. Ten years later, he returns to New York to star in a Broadway show. Despite his success, he still desperately wants his father’s approval. Not only is there no mention of minstrelsy or use of black face, the original musical numbers—which used minstrelsy show tropes—have been replaced with popular jazz standards of the time. This version also inserts a brand new character—Oscar Davis (played by Jivaro Smith)—as a vehicle for discussing the dichotomies that are central to the tale: anti-Semitism and racism, alienation and belonging, duty and personal freedom. Oscar is a Black jazz musician who owns and operates a club where Jackie worked during the 10 years he’s away. Oscar was both a mentor and a second father to Jackie during his time away. Although a talented musician in his own right, Oscar knows that his race limits his dreams and Broadway will never be attainable. Jackie can go there, but only if he is willing to deny his identity and turn the other cheek in the face of naked Antisemitism. The relationship acts as an effective vehicle for addressing the underlying theme of discrimination through a modern lens. While the social themes are central to this work, the show is also a good time, featuring high-energy period dancing and outstanding theatrical singing. Patrick Cook was peerlessly winsome in the title role. His voice is sweet and vulnerable, with a robust core, impressive resonance. He “sings with a tear in his voice” indeed. I was most blown away by the honeyed agility of his performance of “Kaddish”, a traditional unaccompanied Jewish song. Cook’s song and dance duet with Davis wherein they lovingly one-up each other was both charming and astounding. I was impressed that they were able to sing after some of the athletic jumps and quick steps they did. But sing they did. Davis’ singing during his brief but memorable appearances was reminiscent of high-quality coarse silk, supple and textured against the skin. I was also engrossed by the chemistry between Cook and Kaylee Harwood in the role of socialite turned Broadway diva Mary Dale. While the performance duo come from very different walks of life, they are united by the fact that they have both failed to meet parental expectations. The pair’s duets were a riot, and Harwood’s solo performance of Stormy Weather brought down the house. Her rich, velvety voice was even throughout the highs and lows of this song and the story. Costume design by Alex Amini delivered everything I could have hoped for. The orchestra also did a superb job of capturing the feel of The Jazz Age under the direction of Mark Camilleri. The Jazz Singer is a crown jewel in a prodigious tenth anniversary season for Harold Green Jewish Theatre Company. I hope that not only does this cunning, clever, and fun reimaging of a 100-year-old story become canonical, but that the recrafting of stories that are at once timeless and outdated becomes part of the history of theatrical traditions. Ticket prices range from $55-94.